Map Size: Large, no underground. Victory Condition: Capture Both Frigiston and Yanathrae. Loss Condition: Lose Tawni Balfour or Pete Girly. Carryover: Tawni Balfour and Pete Girly and all of their spells, skills, and experience will transfer to the next map along with the Steadfast Shield. All of your heroes have a maximum level of 12.
Who's going to miss a man who never did anything unless it put gold in his pocket? In fact, Captain Black knifed his own brother over a few copper pieces, barely the price of a bowl of porridge. Ha! That's my daddy. Good riddance, I say! 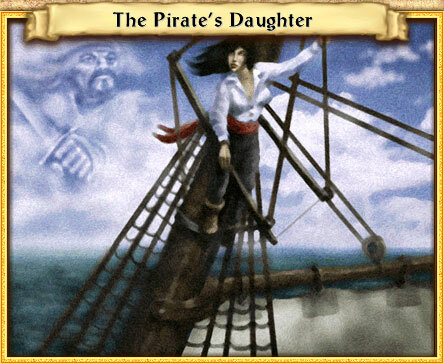 After the death of her infamous pirate father, Tawni Balfour takes command of his ship. She immediately sets out to accomplish something her father never dreamed of doing - conquering the Strait of Storms. Her dream to control the entire Quid Sea begins or ends here. She must defeat the towns of Frigiston and Yanathrae, or fade into mediocrity.